Can Yoga and Bodywork Help My Child's Cerebral Palsy? Can Yoga and Bodywork Help My Child's Cerebral Palsy? Can yoga and bodywork help my child's cerebral palsy? Yoga and bodywork provide significant benefits for children with cerebral palsy. Both forms of therapeutic exercise can help improve muscle tone, flexibility, strength, coordination, and more. Rolfing: Rolfing works to manipulate the fascia and soft tissue in order to improve bodily alignment. It is also known as Structural Integration. The Alexander Method: This method trains the body to work more efficiently. Reflexology: A form of massage. Reducing hyperactivity and improving concentration by using unique breathing exercises and relaxation techniques. If your loved one has cerebral palsy as the result of an instance of medical malpractice and now requires special care, therapy, treatment, or lifestyle adjustments, we encourage you to reach out to our legal team. 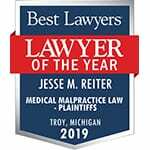 The cerebral palsy attorneys at Reiter & Walsh, PC have over 50 years of joint experience handling cases specifically related to complex birth injury cases. Jesse Reiter, Rebecca Walsh, and the rest of our birth injury legal team has secured millions of dollars for families who are now able to afford resources such as yoga and bodywork.